Thoughts of a Trainspotting Mathematician: What is... the Northern Hub? What is... the Northern Hub? The Northern Hub is a £560 million project to upgrade and electrify much of the railway network in the North of England, particularly focussed on the cities of Manchester, Liverpool and Leeds. As well as electrifying over 300 miles of track, the project will unlock one of the biggest bottlenecks in the country: Manchester Piccadilly station will gain two extra platforms, and the Ordsall Chord will allow trains to run directly between Manchester Piccadilly and Manchester Victoria. All in all, rail travel in the North of England will be transformed. You may have noticed that, so far in this series of blogposts, the projects we've looked at - e.g., Crossrail, Thameslink and the Great Western Main Line - are all in the South of England. It's fair to say that the South - particularly London and the South-East - gets more than its "fair share" of investment compared to the proportion of the population that lives there. To a certain extent, the Northern Hub will help to smooth out that imbalance. It's important to understand why there's an imbalance in the first place: the fact is that railways are most efficient in dense urban areas and between big cities. As a result, railways naturally gravitated towards London and the South-East, meaning more people used the railways in London, meaning they got more investment, and this created a "feedback loop" of perpetual investment in the South-East to try and cope with ever-increasing demand. By contrast, while the urban areas in the North of England have received some investment, the railways in the North don't get used as much, so they don't get as much investment, and hence their use doesn't increase as quickly. While much of the South-East has 12-carriage commuter trains into London, four carriages already makes a long commuter train into Manchester, and most platforms can't accommodate more than six. This isn't in and of itself a problem, nor is it necessarily a sign of bias in investment priorities, but it is nonetheless a reality. However, the use of relatively short trains does make the North's trains less efficient to run: a 12-car train doesn't cost six times as much to run as a 2-car train, not least because you still only need one driver and one guard. What's more, almost all of the North's trains are diesel trains: by contrast to the South-East, where the only major commuter line which isn't electrified is the Chiltern line out of Marylebone, so far there are just a handful of electric lines around Manchester and Leeds, and (as I discussed previously) diesel trains are more expensive to run. Happily, though, an opportunity to make the North's railway network far more efficient came when then-Transport Secretary (Lord) Andrew Adonis hit on a bright idea. He reasoned as follows: Thameslink is getting a huge fleet of new trains, meaning the 86 4-car Class 319s will no longer be required. The trains could simply be moved to another already-electrified line to displace some older trains and allow them to be scrapped, but instead Adonis decided to invest in electrifying new lines, and send the Class 319s there. This allows lines to be electrified without incurring the additional cost of a brand-new fleet of electric trains, a significant saving. One of those lines is the Great Western Main Line, where new electric inter-city trains will replace the existing HSTs, and the Class 319s would be used on suburban services in the Thames Valley between London and Reading, Oxford and Newbury. Preston-Blackpool North to be electrified by December 2015 (though this has now slipped to February 2017). The Chat Moss electrification was announced first, in July 2009, with the other lines following in December 2009. The initial announcement came rather out of the blue: it is not entirely clear why the Chat Moss line was chosen, but if Adonis's intention was to start the ball rolling on significant investment in the railway network across the north of England, he picked the right line! Although they initially put the plans on hold thanks to the post-election Spending Review, the new coalition government reconfirmed the plans in October 2010. The class 319s are to be cascaded to the North-West, permitting older diesel trains (such as the dreaded Pacers) to be scrapped. All told, about 35 Class 319s will be needed across the North-West. However, due to delays in the Thameslink Programme, while the first two phases of wiring will be completed by December 2014, there will only be three electric trains available to run the local services. A further 11 will follow over the following year, which will account for all the Liverpool-Manchester and Liverpool-Wigan services, with the remainder of the trains being available early in 2017 for the completion of the third and fourth phases. One of the most important diesel-operated services in the North, however, is the Trans-Pennine service between Manchester and Leeds, with five trains an hour running between these two huge cities. Most start in the west at Liverpool or Manchester Airport, while in the east the trains continue on to Hull, York, Scarborough, Middlesbrough or Newcastle. With one of the routes between Liverpool and Manchester now being electrified, and the ECML between York and Newcastle already wired, that leaves only a relatively short gap between Manchester and York; wiring that gap would permit a disproportionate number of services to be converted to electric operation. Moreover, the Trans-Pennine services are some of the most overcrowded trains in the North, and as reasonably fast inter-urban services they are a plum candidate for investment, sure to bring more significant benefits than merely electrifying commuter lines. Sure enough, in November 2011, the government announced a follow-on to the North-West Electrification: the Trans-Pennine route between Manchester, Huddersfield, Leeds and York is to be electrified by 2018. The line from Leeds to Selby (though oddly not all the way to Hull) was added to the electrification plans in July 2012. All the big stations along the way (Liverpool Lime Street, Manchester Piccadilly, Leeds and York) are already electrified, while Manchester Victoria will be electrified as part of the North-West Electrification, making this project relatively simple; instead the big challenge will be electrifying the 3-mile-long tunnels at Standedge (under the Pennines) without causing too much disruption. However, before the benefits of a more frequent electric Trans-Pennine service can be realised, one of the biggest capacity bottlenecks on the network has to be sorted out: Manchester Piccadilly station. It may strike you as odd to learn that, in spite of its proliferation of short commuter trains, Manchester Piccadilly station is running more or less at capacity: there is no more room to run more trains. Manchester Piccadilly is an odd station: it has 12 terminus platforms, all facing south, used by services long-distance from London, Bristol, Bournemouth, and Cardiff, as well as local services to Stoke-on-Trent, Crewe, Chester, Glossop and Sheffield. However, the station also has two through platforms at its west side, used by services to Liverpool, Preston, Blackpool and Scotland. That there are only two such through platforms is already a capacity constraint, and plans are in place to add two extra through platforms by 2018. Enter the Ordsall Chord. 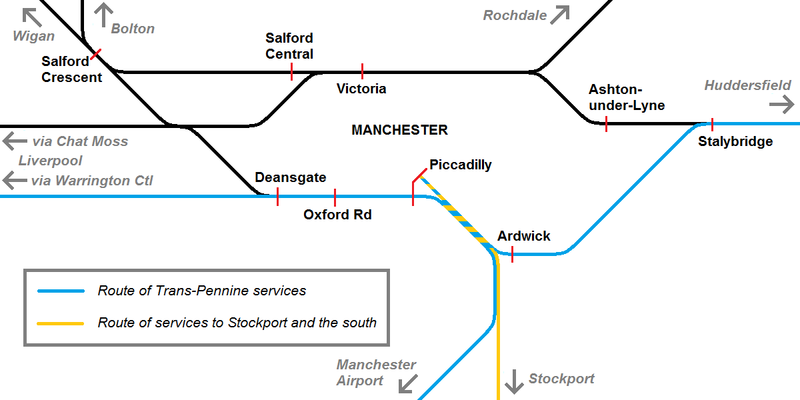 From 2016, a short piece of track will fill in the third side of the triangle in western Manchester and allow trains from Piccadilly to curve round and head through Victoria, Manchester's other major station. Once the grand centerpiece of the Lancashire and Yorkshire Railway, Victoria is a shell of its former self, particularly since the Windsor Link was opened in 1988 and many services were transferred to Piccadilly. Access between the two has always been rather difficult, and while Metrolink has made it easier, the Ordsall Chord will provide a direct rail connection between the two stations for the first time. Once completed, it will allow Victoria, not Piccadilly, to become the hub for Trans-Pennine journeys. 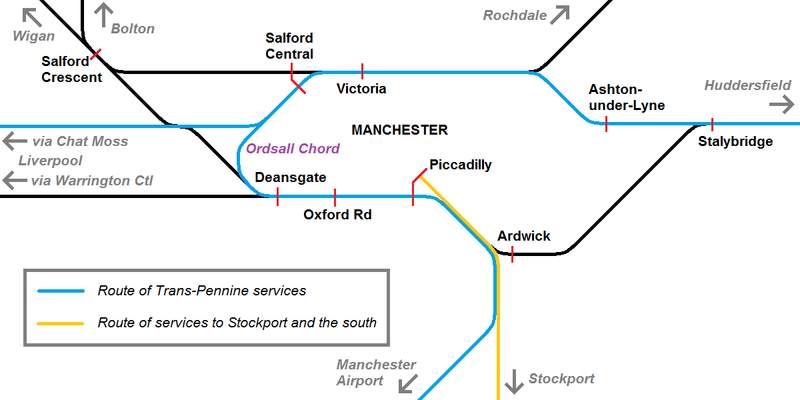 The Ordsall Chord will permit trains between Manchester Airport and Leeds to run via both Piccadilly and Victoria, and avoid having to reverse along the way. While trains between Liverpool and Leeds can already run via Victoria without any capacity problems, to do so requires diverting them via Chat Moss instead of via Warrington Central; coincidentally (or perhaps as a rare piece of forward planning?) the Chat Moss is the route that's being electrified, while the route via Warrington Central will remain diesel-only. As a result, by 2018 the rail network around Manchester will be transformed by two extra platforms at Piccadilly, the Ordsall Chord connecting Piccadilly and Victoria, and electrification across much of the North-West and the whole Trans-Pennine route from Liverpool to Newcastle. Put it all together and you have the "Northern Hub", whose total cost is about £560 million. The only problem is the lack of clarity in what trains will be running on such lines: the letting of new franchises for TransPennine Express and Northern Rail has been delayed until February 2016, and only once the new franchise is announced will it become clear what, if any, strategy there is for rolling stock across the North. One possibility is that the remainder of the Class 319s, perhaps together with some of the other trains released by Crossrail and the Thameslink Programme, could be used on Trans-Pennine services. Currently, however, the Trans-Pennine services run with Class 185s, modern three-car diesel trains which are less than 10 years old, ideally suited for inter-urban services. To replace those with commuter trains from the South-East which are nearly 25 years old is clearly a downgrade, and smacks of the North being handed the unwanted old tat from the South-East. Unlike the North-West Electrification, however, which could only be reasonably justified by the use of existing trains, it's quite possible that the new Trans-Pennine franchise will decide to order some new electric trains to run across the Pennines. This would allow some (if not all) of the Class 185s to be transferred elsewhere, and trigger a rolling stock cascade that would ensure that many areas benefit from newer trains, while allowing more of the oldest clapped-out trains (hopefully all the Pacers and possibly some Sprinters) to be withdrawn from service. Previous post: What is... the Intercity Express Programme? Next post: What is... the Electric Spine?